With the start of the new academic year, Radiology has been keeping me quite busy over the past couple of months. However, I wanted to make at least one trip to Mt. 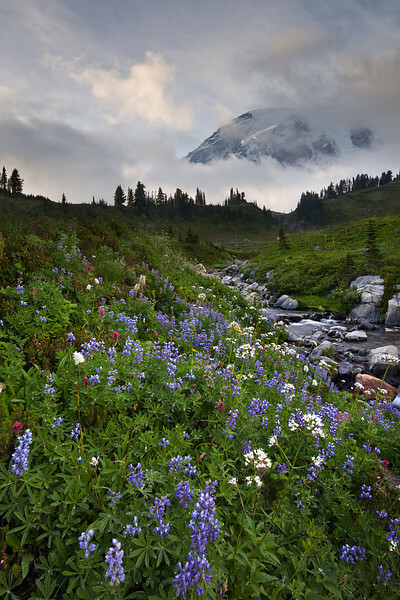 Rainier National Park this summer. 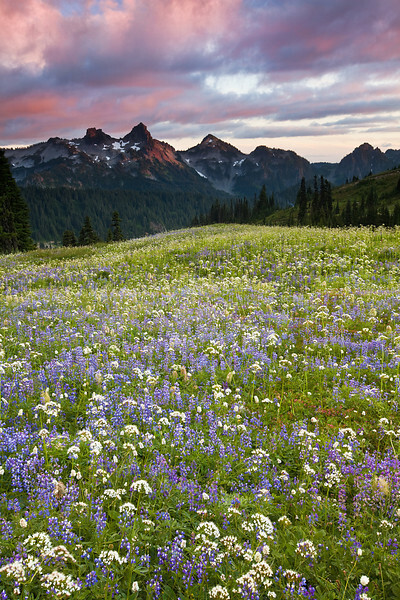 I recently read in the local paper the wildflowers were peaking late this year at Paradise. So I headed out this afternoon with a friend to see what we could find. We were not disappointed. The ranger suggested the Myrtle Falls trail, an easy 1 mile jaunt from Paradise Visitor’s center. 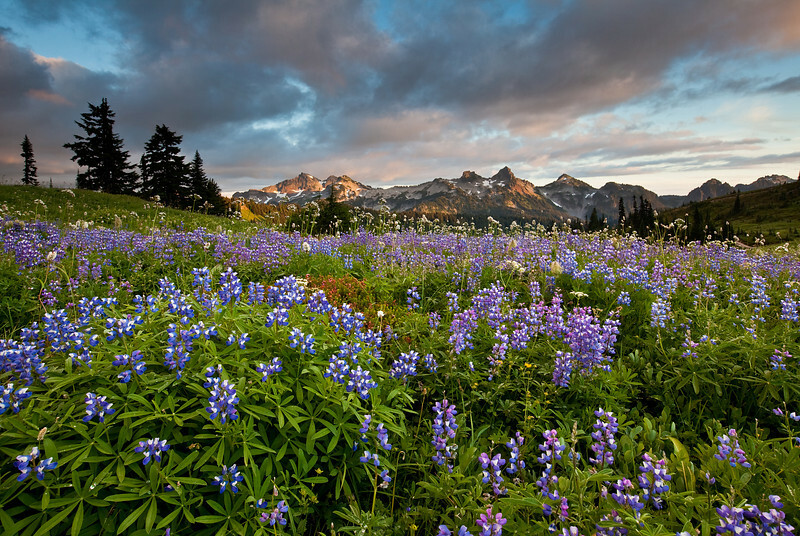 We arrived late in the afternoon and witnessed fields of lush lupines and beautiful light on the Tatoosh mountain range. Mt. Rainier was constantly playing hide and seek with the clouds, but we did manage to get a few glimpses of her before dark. The opening image gives you an idea of how wonderful the lupines are up there. If you haven’t already, I highly recommend a trip to Mt. Rainier before these beauties fade away. Below are a few more shots from the trip. I hope you enjoy them, and please feel free to leave comments. they are gorgeous. You are so gifted…. Karen, thanks for the kind words…really appreciate it! That opening image is gorgeous!! Spectacular light. Larry, thanks much! Ya, that opening image is my favorite of the bunch. I was scrambling to get to the correct spot to frame all the elements the “right” way. Stunning! I’m gonna see if I can do that much of a walk with my cane. So very very glad I made my first purchase with you and have gotten to see your continuing captures of beauty. Linda, thank you so much. I think the hike to Myrtle Falls and a little beyond is absolutely beautiful. If you make it up there, be sure to let me know how you liked it. I’m sure you won’t be disappointed! That first picture is awesome. Did you use automatic exposure bracketing for and then layering? Randy, thanks for the comment! You’re absolutely correct. I exposure bracketed that scene and later combined them in Photoshop with layers to get the “perfect” overall exposure. I love the water before dark and the ribbons flowing down Myrtle falls. That’s what i want to be! Rachel, thank you! Mt. Rainier is one of my absolute favorite places. I know exactly how you feel. Wow, beautiful. Mahesh, you really capture some of the essence of being there. I can almost smell the Lupine and earth aroma. Stacy, thank you so much. I smelled the lupines first hand. I think I might have enjoyed it more had it not been for my allergies. I LOVE mt. Rainier!!!! Gorgeous shots, Dr. Thapa! Barb, thanks. I had a feeling you’d like these.